I've been scratching my head for a few months now wondering what to do with the bottle of Hawaiian black lava salt I bought at a food emporium (Giovanni's Deliworld) in Cape Town, and after some deliberation have come to the conclusion that this is an ingredient that must be used tongue in cheek. As a feeble culinary joke, I mean. I can think of no other use for this salt. Sure, it's an interesting product, with its large, crunchy, jet-black, rather greasy-looking granules, but when push comes to shove, it's just salt, and it tastes, well, salty. It's no use for dishes containing liquid, because the colour runs from the crystals, making sooty streaks in sauces and dressings. So I reckon the best way to use black salt is as a cheeky novelty. In this, my take on that popular dish salt-and-pepper squid, I've reversed the colours of the two starring seasonings, combining the black salt with one of my favourite spices, white pepper. If you can't find black salt, use a good brand of flaky sea salt, such as Maldon. Japanese panko breadcrumbs aren't essential for this dish - you can use ordinary fresh or dried breadcrumbs - but they are well worth hunting for because they have a feather-light texture that creates a beautifully light, crisp whisper of a crust. They're available at specialist Oriental food shops and some delicatessens; I bought mine at the Spar in the Cape Quarter. These are good with a salty-sweet Asian dipping sauce of lime juice, soy sauce and chilli but, because I don't often make deep-fried anything, I went the whole hog and served them with a zesty mayonnaise with fresh lime juice and rind. In for a penny, in for a pound, I reckon. The only tricky aspect of this recipe is getting the oil temperature just right. If it's too cool, the crust will soak up oil and become soggy. If it's too hot, the calamari will overcook. If you have a candy thermometer or digital thermometer, use it to keep the oil at between 160º and 165º C. If you have no such thing, follow these instructions for deep-frying. Finally, do use small, tender, good-quality calamari tubes for this dish. 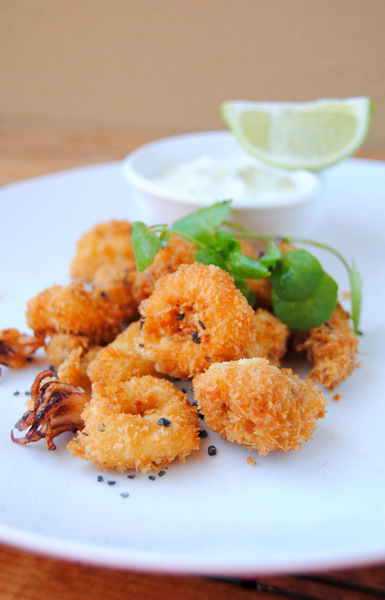 Fresh calamari is sometimes available at good fishmongers and at Woolworths. If you can't find fresh calamari, look out for packs of frozen Patagonian squid, which is now being sold in South Africa. Avoid, at all costs, the rubbery pre-cut frozen rings you see in the supermarket. 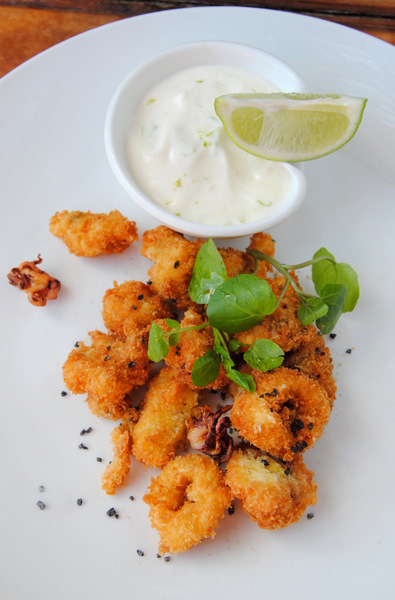 If the calamari you buy comes with tentacles, dust them with a little seasoned cornflour and deep-fry them in the same oil to use as a crisp garnish. First make the mayonnaise. Mix the mayonnaise, yoghurt and lime zest together in a small bowl. Add just enough fresh lime juice to give the sauce a good 'bite'. Season with salt and refrigerate. Turn the oven on to 140º C and place a big platter in it to warm. Rinse the calamari tubes, pat dry with kitchen paper and slice into rings about 7 mm thick. Put three medium-sized bowls on the counter. Put the flour, white pepper and black salt into the first bowl, and mix well. Put the eggs into the second bowl and whisk until combined. Put the panko crumbs in the third bowl. Pour the oil into a small saucepan or a wok. Heat the oil to 165º C, or until a crumb dropped into it sizzles furiously (see my notes above). Place several layers of newspaper or kitchen paper on your counter. Prepare the calamari in four batches. Take the first quarter of rings and toss them in the seasoned flour. Shake well to remove any excess. Dip them into the beaten egg, and then place them in the bowl full of crumbs. Using a fork, toss them lightly so that they are just coated with crumbs. Drop the rings into the hot oil and fry for a minute, or until they are a light golden brown. Remove from the hot oil with a slotted spoon and drain on the kitchen paper. (And, once they're well drained, put them in the oven to warm.) Remember that the calamari will carry on browning after you've taken it out of the hot oil, so fish the rings out of the pan long before they begin to darken. Repeat with the remaining calamari rings. Pile the hot calamari on a platter and dust with a pinch of white pepper (exercise caution here: it's a very pungent spice) and a scattering of black salt. Serve piping hot with the lime mayonnaise, and a few lime wedges. Yay I have been looking for panko, so am happy to know here you got. I also love white pepper and prefer it to black in many dishes. That looks fantastic! I could easily gobble up an entire plate in a second. Love the black salt! Loos divine! Will definitely give it a try sometime. I have only one question - can I come to dinner?? ;o) I am a sucker for novelty salts - we did a salt tasting once and interestingly enough the texture and crystal structure do subtly alter the way you perceive the overall saltiness. Nice shots! hmmm... looks amazing! Black salt? yes please!